I have studied the subjects of Soteriology and Harmatiology, the studies of salvation and sin, more than just about any other subjects. Not because these are my favorite subjects but there has been a doctrinal thorn in my side due to what I was taught in church concerning salvation and sin. What I was taught did not make sense and I needed to find the Truth for myself. I have studied them intensely for the last fifteen or so years because I was never satisfied with the way I was taught about Original Sin and salvation. It never equaled out so-to-speak. You know when you have an equation and the stuff on the left side of the equal sign is suppose to equal the stuff on the right. Well, the way this has been taught traditionally just does not equal out. I always had a check in my spirit about the teaching that because of Adam’s sin, not because of our own sins, we all are bound for Hell. It does not make sense but people have learned to accept it and keep going without studying it. I could not do that. I did not realize my background in a Baptist church and Reformed Presbyterian church as a child had such deep roots in my theology. I thought when I came over to the Pentecostal side that I was set free, but I wasn’t because we, especially the Charismatics, were taught the same stuff from our previous denominations. Most never questioned it because parts of it seem to make sense “namely that we’re all sinners so we all need salvation.” Why mess with such an important thing as that? Well, the truth is that part of the theology is correct. However, as often happens, religion uses such a Truth to springboard into an untruth then starts building more and more untruths on top of that. Just because one statement at the beginning is true does not make every one built upon it also true. I can finally say I am free from the erroneous denominational theology that had plagued me for years concerning Soteriology. I want to share with you what Truth I have found in the Word. I believe it will set you free because of the application it has to your daily living or it may just make you mad if you refuse to part from religious teaching. Either way, I am going to share with you a labor of love in this article and I hope you will diligently search the Scriptures and think about it instead of standing on whatever you may have been taught in Bible school or seminary or church. Do not take my word for anything but look at the Word of God first and foremost. Augustine of Hippo was an early Roman Catholic theologian that lived 354 – 430. His theology strongly influenced John Calvin. Upon Augustine and Calvin (1509-1564) the doctrine of Calvinism was developed which greatly influences the doctrine of many believers even today. 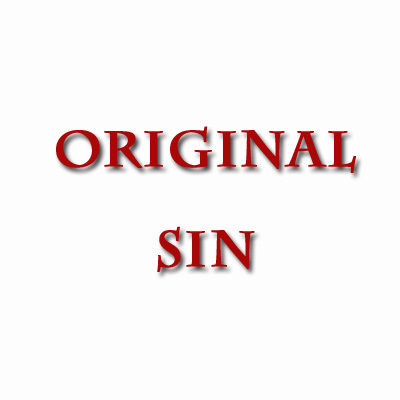 The Augustinian view of Original Sin believes that man is born a sinner due to Adam’s sin. It states that sin has infiltrated every part of a man’s being so that he is morally depraved. Man has a sin nature in every part of his being. Man is essentially guilty of the sin of Adam which is the reason man dies physically and spiritually. Even new born babies are sinners; if they die prematurely, they are thus condemned to hell due to Adam’s choice. The concept of babies going to Hell is distasteful even in the eyes of some Augustinians and Calvinists so they often say the babies may go to Heaven but they cannot give a Biblical explanation as to why. However, their very doctrine contradicts such a conclusion. The problem with the Augustinian view of Original Sin is that it is not completely biblical. There are some parts that are and the rest are religious assumptions. Once untruth is mixed with Truth, there is no more Truth. Religion often tries to make God look bigger by making man look smaller. This is unnecessary. God’s Word tells us the Truth about God and we can add nothing to It. Religion claims things like Total Depravity meaning man is born depraved spirit, soul, and body. But God does not need a man to defend Him. He gives His Word for a defense and if the Total Depravity of man is not in the Bible, then it should not be taught. I learned a long time ago to just stick to the Word. Do not add to It to try to make God look better by making man look more depraved than he really is. In opposition to Augustianism is Pelagianism. Pelagian was a British Monk born around 370. Pelagianism goes to the other extreme and says Adam’s sin did not make us born sinners but his sin only affected himself. That means man is not born with a propensity or inclination to sin at all in any part of his being. He believed every human spirit is immediately created by God thus it has no sin nature. Only the sins we consciously commit are we responsible for as opposed to the unconscious sin Calvinism says we committed in Adam. But this belief does not line up with the sin nature that the Bible teaches that we do have due to Adam’s sin. It must be clear from the beginning that all men have sinned. There is not one man, other than Jesus, that did not commit at least one sin thus making them a sinner. Psalm 143:2 for in thy sight shall no man living be justified. 1 Jo 1:8 If we say that we have no sin, we deceive ourselves, and the truth is not in us. Read also Proverbs 20:9; Luke 11:13; Romans 3:19, 23. The universality of sin is shown also by the fact that condemnation rests upon all who have not accepted Christ. 1Jo 5:12 He that hath the Son hath life: and he that hath not the Son of God hath not life. Augustine believed Adam’s sin makes us sinners. Pelagius believed our own sins make us sinners. The fact is that both views are correct to some degree. And by the same token they are also incorrect. I believe I have found the most ignored concept in the Bible: the teaching that man is a spirit, soul, and body and what that means. 1Th 5:23 KJVR And the very God of peace sanctify you wholly; and I pray God your whole spirit and soul and body be preserved blameless unto the coming of our Lord Jesus Christ. This is the ingredient everyone has neglected in the formation of their doctrines. Because theologians have not paid closer attention to this doctrine, called the trichotomy of man, they have been warring for hundreds of years over things that are as clear as day if we read the Bible literally accepting 1 Thessalonians 5:23: “your whole spirit and soul and body”. The lack of understanding that man is a spirit, soul, and body when the formations of Augustianism, Calvinism, Arminianism, Pelagianism, and any other “ism” you can think of began, has caused the proponents of these doctrines to read the Bible incorrectly. This author believes that if only they had understood the trichotomy of man at the beginning, there would be virtually no debate today. However, now that some people have been heavily indoctrinated, in some cases every time the church doors open, in their skewed beliefs, it will be impossible for them to consider this new information. I pray that you will consider this information and make sure what you believe is not a doctrine passed down by men but it is directly out of the Bible. “Moreover, there can be no question that man consists of a body and a soul; meaning by soul, an immortal though created essence, which is his nobler part (1. Calvin, Institutes). Even today most churches still think of man as a dichotomy, consisting of only soul and body. We hear this in the phrase many souls were saved last night. But if we were to Biblical we would say spirits were saved. Jam 1:21 KJVR Wherefore lay apart all filthiness and superfluity of naughtiness, and receive with meekness the engrafted word, which is able to save your souls . The book of James was written to believers. Therefore, they were already saved yet James speaks about the saving of their souls. Their spirits were saved which was a one-time event. However, the salvation of the soul, or mind, is a continual process. For a Christian, the spirit man is saved, the soul is in the process of being saved, and the flesh is not saved. To me, the most important revelation you can have to understanding your Bible is this: Man is a spirit, soul, and body. Man is not just a soul and body or spirit and body. Man is a trichotomy (having three divisible parts). The spirit of man contacts the spirit realm and it is this part of man that is born-again. Joh 3:3-8 KJVR Jesus answered and said unto him, Verily, verily, I say unto thee, Except a man be born again, he cannot see the kingdom of God . (4) Nicodemus saith unto him, How can a man be born when he is old? can he enter the second time into his mother’s womb, and be born? (5) Jesus answered, Verily, verily, I say unto thee, Except a man be born of water and of the Spirit, he cannot enter into the kingdom of God . (6) That which is born of the flesh is flesh; and that which is born of the Spirit is spirit. (7) Marvel not that I said unto thee, Ye must be born again. (8) The wind bloweth where it listeth, and thou hearest the sound thereof, but canst not tell whence it cometh, and whither it goeth: so is every one that is born of the Spirit. The spirit of man is born by the Spirit of God and it is flowing with the life of God in its spiritual veins. That life is the water described in verse five (Isa 58:11; Jer 2:13; Joh 4:10-14; Rev 21:6). We must be born by the life of God by the Spirit of God to enter into the Kingdom of Heaven . Calvin and Arminius did not have a full understanding of what the soul of man was for they equated it to the spirit of man. The soul of man contains the natural mind, will, and emotions of man; it is not the spirit-man. The Bible also speaks of the soul in a separate sense in which it is the vitality of life that is present in all living creatures. Gen 2:7 KJVR And the LORD God formed man of the dust of the ground, and breathed into his nostrils the breath of life; and man became a living soul. Heb 4:12 KJVR For the word of God is quick, and powerful, and sharper than any two-edged sword, piercing even to the dividing asunder of soul and spirit, and of the joints and marrow, and is a discerner of the thoughts and intents of the heart. If the soul and spirit can be divided, they must be different entities. The spirit man contacts the spirit realm. Man’s body contacts this physical realm. The body is our “earth-suit” without which our spirits and souls could not remain on earth. The soul is part of man that makes the decisions as to what the man does spiritually and physically. With the spirit man we are God-conscious. With the soul we are self-conscious. With the flesh we are worldly-conscious. 1Co 2:14-16; 3:1-4 KJV But the natural man receiveth not the things of the Spirit of God: for they are foolishness unto him: neither can he know them, because they are spiritually discerned. (15) But he that is spiritual judgeth all things, yet he himself is judged of no man. (16) For who hath known the mind of the Lord, that he may instruct him? But we have the mind of Christ. (1) And I, brethren, could not speak unto you as unto spiritual , but as unto carnal , even as unto s in Christ. (2) I have fed you with milk, and not with meat: for hitherto ye were not able to bear it, neither yet now are ye able. (3) For ye are yet carnal : for whereas there is among you envying, and strife, and divisions, are ye not carnal, and walk as men? (4) For while one saith, I am of Paul; and another, I am of Apollos; are ye not carnal ? In the above passage “natural man” translates literally to the “soulish man”. So we see a spiritual man, a soulish man, and a carnal man all included in this passage. Thus, we see here another division of spirit, soul, and body. There are spirit-ruled spiritual people, mind-ruled soulish people, and the body-ruled carnal people. The New Testament is clear that there are three divisions of man: the spirit, soul, and body. Depravity means the corrupt condition of man. This depravity is the sin nature or the inclination to sin inside every man. Understand that man does have a sin nature in his flesh from birth. It is correct to state that man’s flesh is depraved; the flesh is totally corrupt. It cannot do good in itself. It is completely morally corrupt and separated from the life of God. Spiritual death is the separation of the life of God from man. The flesh is spiritually dead. It is not redeemed nor is it able to become or do anything good. Rom 8:7 (AMP) [ That is ] because the mind of the flesh [ with its carnal thoughts and purposes ] is hostile to God , for it does not submit itself to God’s Law; indeed it cannot. Rom 7:17, 18 Now then it is no more I that do it, but sin that dwelleth in me . For I know that in me (that is, in my flesh,) dwelleth no good thing : for to will is present with me; but how to perform that which is good I find not. Rom 7:23, 24; 8:1 But I see another law in my members, warring against the law of my mind, and bringing me into captivity to the law of sin which is in my members. O wretched man that I am! who shall deliver me from the body of this death There is therefore now no condemnation to them which are in Christ Jesus, who walk not after the flesh , but after the Spirit. Rom 6:6, 12 Knowing this, that our old man is crucified with him, that the body of sin might be destroyed, that henceforth we should not serve sin Let not sin therefore reign in your mortal body, that ye should obey it in the lusts thereof. But understand we are not condemned for having a sin nature (having sinful inclinations). We are only condemned when we knowingly sin or give in to that sin nature. In other words, it is not a sin to have a sin nature. It is only a sin when we act on that sin nature. 1Co 9:27 (ALT) But I beat my body black and blue [fig., keep my body under control] and bring [it] into slavery [fig., make it ready to serve], lest, having preached to others, I myself become disqualified. Paul beat his body black and blue figuratively speaking so as to keep it from dominating his life and determining his actions. The flesh must come under subjection to our spirits in accordance with the will of God even though it has evil propensities. Again, the propensity to sin is not wrong; only acting on that propensity is wrong. 2. Arminius, James. Works of James Arminius, Volume 1 . Grand Rapids , MI : Christian Classics Ethreal Library, http://www.ccel.org/ccel/arminius/works1.html . 3. Arminius, James. Works of James Arminius, Volume 2 . Grand Rapids , MI : Christian Classics Ethreal Library, http://www.ccel.org/ccel/arminius/works2.html .